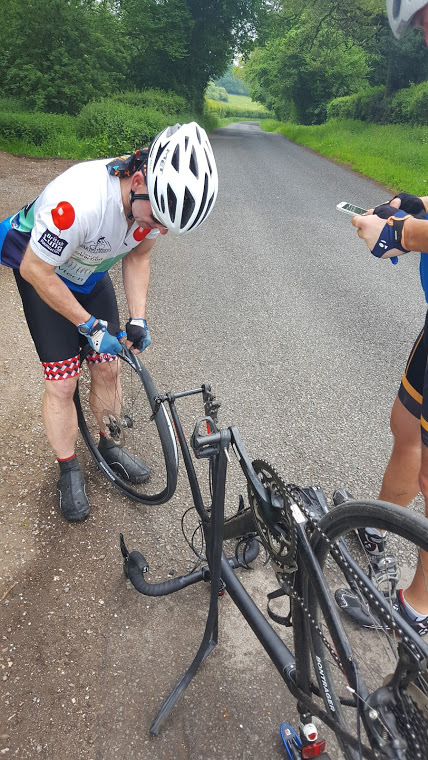 IoW Day 1 – Punctures, Wind & Snoring! Without doubt this was one of our most eagerly awaiting rides. We’ve had this planned in the diary for months. 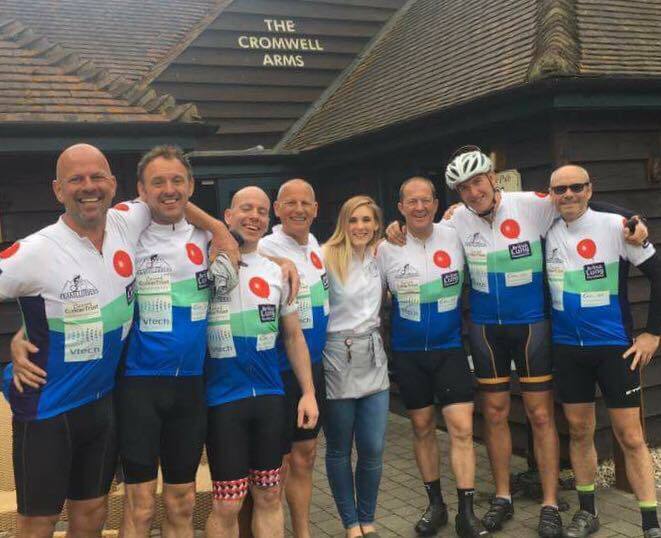 We were cycling to the IoW from Wantage to spend the entire bank holiday weekend with the wonderful people from the Caring Cancer Trust…including the children the Peaky Climbers have helped raise funds for…A-M-A-Z-I-N-G! A 7am start for those leaving Denchworth (Cricky, Simon and guest Peaky for the day, or most of it, Graham), then swinging into Grove to pick up Allen and Nobby then on to Wantage to meet with Macca and Stewie. 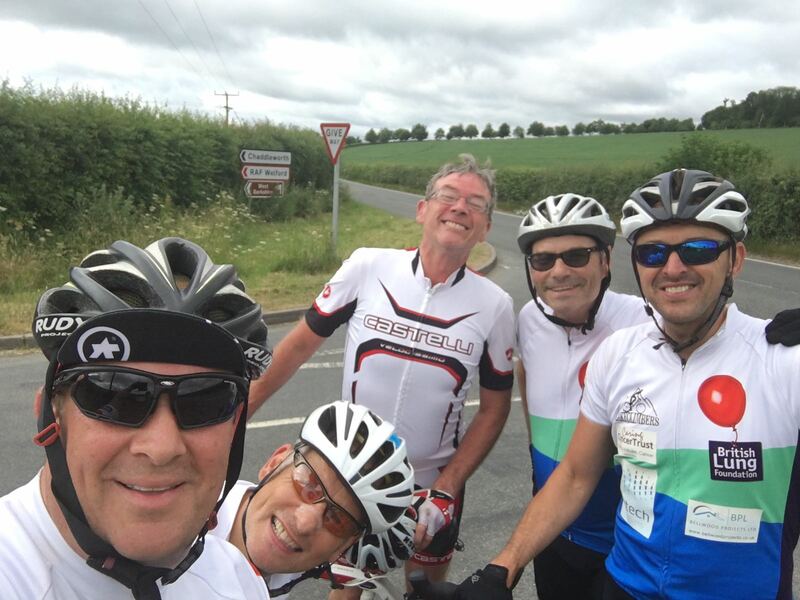 The lads shot up Manor Hill and met JB at the top…we were now ready for our 100 mile ride to the Kingswood Centre, Bembridge. Once over the top, 5 minutes later Allen got the first puncture of the day! After a swift pitstop it was on to Great Shefford, then the second major incident of the day. Graham had a massive blow out that literally burst his tyre, fortunately due to work issues (more later) Ben met us here and his wonderful ‘better half’ Katherine kindly offered to ferry Graham back for repairs. The 8 Peaky Climbers headed onwards and upwards to Hungerford, where Stewie departed for the day to circle back and spend some much needed time with his 4 week old son Niko and the rest of the family. The remaining 7 Peaky Climbers pushed on towards Andover. The weather for the Peaky Charity Golf Day was 27 degrees plus, today it was cooler, windier and stormier. All the guys were in great spirits and pushed on at a decent pace, only for Macca to be hit with his first ever puncher. Fortunately, Allen was on hand to manage an expert change over and within minutes we were back on track and the Peaky train continued to head south. Now…with the weather being somewhat inclement, our trusty navigator, Mr John Boaler, was finding it challenging to get a GPS signal on his Garmin. It woudn’t be a Peaky team ride without the odd 5 or 10 mile detour…what’s a few extra miles amongst mates! Back on track we headed through Stockbridge and Mottisfont, towards Romsey. All the guys were getting a little hungry at this point so an executive decision was made that now would be a great time for a lunch stop. As luck would have it and as if by magic the wonderful Cromwell Arms in Romsey was the perfect place to stop. We looked perfect in our Peaky kit to gate crash the wedding reception going on and were superbly looked after by the wonderful staff. Food was superb! By this time, Graham managed to get his bike fixed and meet us here not only for lunch but to continue the journey to the ferry. We sped through the remaining countryside, heading towards an incredibly busy Lyndhurst. Bumper to bumper traffic had all the guys reminiscing about family holidays from days gone by…those were the days! It was through the New Forrest then onto Lymington in perfect time to board the ferry to Yarmouth. Once off the ferry, it was a beautiful but very challenging and hilly 20 mile ride to Kingswood. The boys made good speed and arrived in perfect time to be met by the smiling Mrs Boaler who was kind enough to drive all the Peaky kit down for the weekend. We met Ian from the Caring Cancer Trust who showed us to our dorms for the weekend. It was then a quick shower each as the FA Cup Final kicked off at 5.30pm with an eager Cricky and Macca keen to support their teams. A well earned beer and pizza meant that the lads were well fed ahead of tomorrow, which would prove to be an incredible day. Lights out at 11pm was the plan. They were out, but unfortunately so was Ben, which meant he snored until 7pm which meant that Cricky and the ‘cheerful’ skipper had tough sleepless nights. In fairness so did the lads next door as they heard both Ben snoring and Macca shouting at him to ‘shut up’…or words to that affect. Next…4,500+ feet of climbing & the CCT Kids meet the Peaky Climbers!